Making Burgers? Make Them Tasty! 4 beef, veggie or turkey burgers, your choice! 1 MIX Hellmann's® or Best Foods® Real Mayonnaise, pickle relish and Ketchup to make our special sauce. 2 GRILL your burgers as desired. 3 TOP with our special sauce, lettuce and tomato. 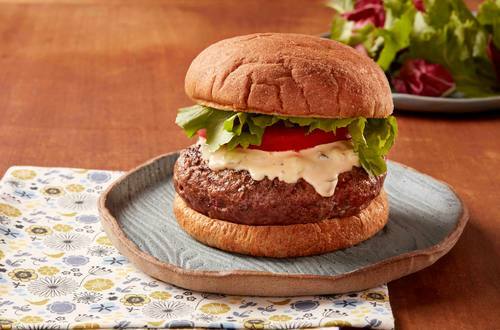 The creamy Hellmann’s mayonnaise is the perfect base to any sauce to ensure a delicious burger every time. CREAMY SRIRACHA SAUCE: Combine 1/2 cup Hellmann's® or Best Foods® Real Mayonnaise with 2 tsp. sriracha. Makes 1/2 cup. RANCH & BACON SAUCE: Combine 1/2 cup Hellmann's® or Best Foods® Real Mayonnaise with 2 tsp. cider vinegar, 1/2 cup crumbled blue cheese and 2 Tbsp. cook, crumbled bacon. Makes 3/4 cup.